Vie for mastery of the Continent in the era of Edwardian Europe. 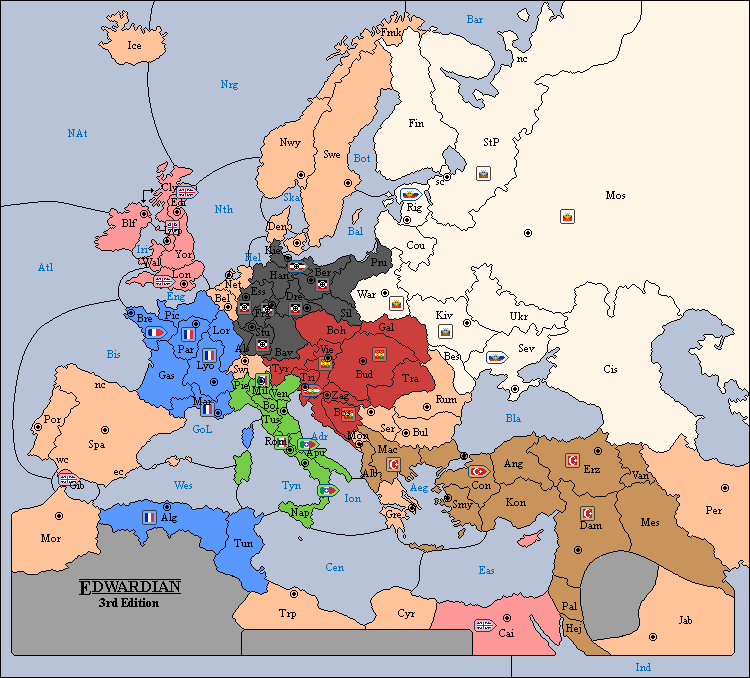 Edwardian 3rd Edition is a Diplomacy variant set at the beginning of the Edwardian era in the turn of 20th century Europe. 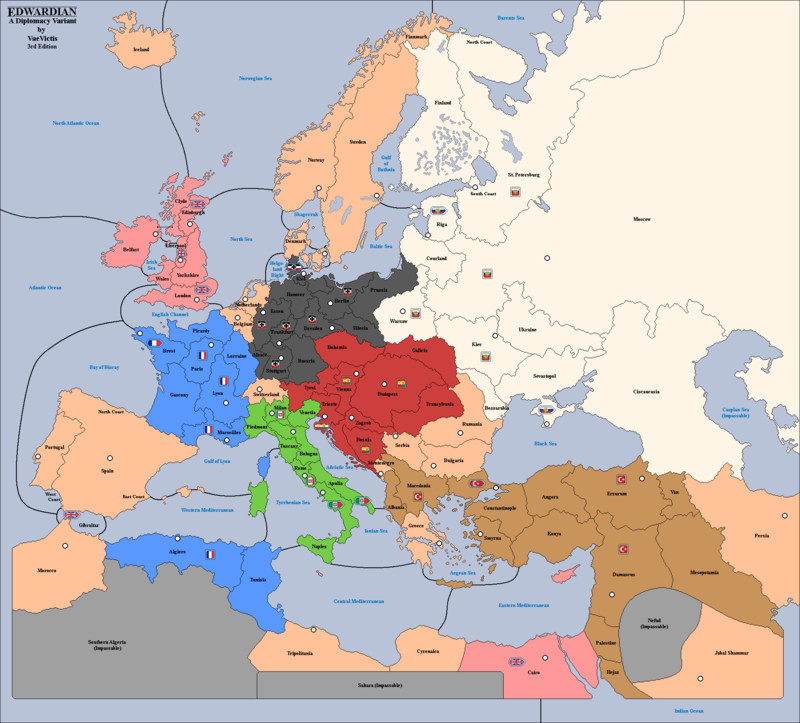 The variant is based upon Classic Diplomacy in its setting and motif, resembling some of the characteristics of the original, though expanding the scale of supply centers and pieces available to players, producing unique opportunities and challenges for diplomats seeking to dominate Europe. Edwardian also incorporates some aspects of Baron M. Powell’s 1900, most specifically in the employment of the Gibraltar province and rules allowing armies and fleets to move over it and the ability to convoy through Gibraltar as if it were a sea space. Alterations from Edwardian 2nd Edition mostly concern attempts to balance and streamline the map. These include: improving the spaces around Britain and France to relieve natural tension; reordering of German and Austrian provinces in central Europe to remove dead spaces; a compacting of Russian spaces for easier defense; the addition of Jabal Shammar as a supply center for a total of 51; and a new victory condition of 20 out of 51 supply centers. The start date is Spring 1901, the beginning of the Edwardian Era. Gibraltar is considered a coastal space, but a fleet in Gibraltar is allowed to convoy. Southern Algeria, Sahara, Nefud and the Caspian Sea are considered impassable. Land Bridge: There is a land bridge that connects Belfast (Blf) and Clyde (Cly). Canal Spaces: Cairo (Cai), Constantinople (Con), and Kiel (Kie) are canal spaces that allow for fleet and army movement. Ionian Sea (Ion) and Tyrrhenian Sea (Tyr) do not border. Denmark (Den) and Sweden (Swe) border for land and sea movement, but Denmark does not split the coast of Sweden (as in Classic Diplomacy). Several armies and fleets begin the game occupying non-supply center spaces supplied remotely from vacant home supply center spaces. These include: Fleet Gibraltar (F Gib) supplied from Belfast (Blf); Army Macedonia (A Mac) supplied from Smyrna (Smy); Fleet Apulia (F Apu) supplied from Bologna (Bol); Army Bosnia (Bos) supplied from Zagreb (Zag).